To earn the Certified Public Accountant (CPA) license, you have to pass the CPA Exam, which consists of 4 different sections. One of these sections is Auditing and Attestation (AUD). Before you can be completely ready to pass the CPA AUD exam, you’ll need to know about the content, pass rates, questions, format, difficulty, structure, timing, and more. Conveniently enough, you can find all of that information right here and use it to overcome the CPA audit exam. As the AUD CPA Exam Blueprints explain, the AUD CPA Exam section covers the knowledge of auditing procedures, generally accepted auditing standards (GAAS) and other standards related to attest engagements, and the skills needed to apply that knowledge. Now, I have never been an auditor. But, I worked closely with a team of auditors from KPMG and PWC on the audit of my company every year. Upon observing them in action, I believe that auditors, no matter how junior they are, have a distinct advantage over this exam because it addresses exactly what auditors are supposed to do. But, having said that, non-auditors like me can pass the CPA AUD exam. To do so, you simply must be willing to put in extra time and practice. Basically, to pass AUD, you must have a working knowledge of the procedures of the audit. As I mentioned, AUD focuses on auditing. In 4 content areas, AUD addresses the ethics, risk, response, procedures, conclusions, and reporting of the audit process. So, this table breaks down the CPA AUD exam content for you. Preparation, compilation, and review engagements for nonissuer entities and reviews of interim financial information to issuer entities. The AUD CPA Exam Blueprints also explains that AUD assesses candidate abilities related to professional responsibilities including ethics, independence, and professional skepticism. AUD’s pass rates for the last few years have generated their fair share of excitement. In Q2 2018, AUD put up a record-breaking pass rate (for the section) and then, for the rest of the year, continued to enjoy some high passing numbers that we hadn’t seen in a while. While AUD’s pass rates aren’t the most impressive of the 4 exam sections (that title would belong to BEC), AUD’s pass rates are nevertheless notable. It has a history of being second best, as it held that position from 2006-2010 but fell out of the race in 2011. After that, AUD had the lowest CPA Exam pass rate for several years. But 2 years of CPA Exam changes have been good to AUD, as it now stands with REG on the second tier of the pass rate podium. The low points in AUD’s pass rate history are understandable. This section may look relatively straightforward, but it presents some fairly vague questions that can throw candidates off. AUD is more of a conceptual exam than the other 3 exam sections. In contrast, FAR’s questions are mostly computational, while REG’s and BEC’s questions are based on rules. Therefore, AUD’s questions often include multiple answer options that seem correct, but you have to pick the best one. Another reason that candidates struggle with AUD is that they have a background in auditing and therefore underestimate the CPA AUD exam. Even though they work so much with the auditing process on a daily basis, some auditors fail to focus on the big picture very often, so they don’t have the full scope of the auditing process memorized anymore. Other auditors don’t have to complete the auditing process on their own; they only work on parts of it, so they don’t have to recall how to go through the process from start to finish. For these reasons, the CPA AUD exam can trip up even experienced auditors. These tricky aspects of the exam have made AUD a lot more difficult. But thankfully, candidates seem to have been better prepared for AUD’s schemes in recent quarters. Seeing AUD make a move for the top pass rate spot is a bit surprising, considering the fact that AUD is the only exam section to test at the skill level of Evaluation, which requires the most skill in the context of the CPA Exam. The AUD CPA Exam section tests your knowledge of its content with 2 different types of questions: multiple-choice and task-based simulations. AUD assigns these question types equal weight, as both account for 50% of your total AUD score. The question stem: the question stem contains the question being asked (usually found at the end of the stem), details necessary for answering the question, and additional information. Correct answer choice: the 1 answer choice of the 4 provided that best responds to the question. Task-based simulations are condensed case studies that ask you to apply your knowledge and skills to real work-related situations. Completing a TBS involves using information found either in the question or in the exhibits provided to finish tasks such as performing a calculation, filling in a series of blanks, or revising a document. Two important types of TBSs are the Document Review Simulation (DRS) and the Research task. The DRS makes you refer to various resources to analyze a document, while the Research task expects you to research authoritative literature and cite the appropriate guidance. The DRS appears in all 4 CPA Exam sections, but the Research task shows up in just 3: AUD, FAR, and REG. Every CPA Exam section is fully computerized. What’s more, each section features 5 testlets focused on different types of questions. AUD has 2 testlets of 72 total MCQs and 3 testlets of 8 total TBSs. The total number of questions in each CPA Exam section includes both operational and pretest questions. Your score for that exam section only depends on your performance on the operational questions, not on the pretest questions. Pretest questions have a different purpose: the AICPA uses them to collect candidate performance data so the AICPA can decide whether to include them as operational questions on future iterations of the exam. Though the significance of operational and pretest questions differs, the appearance does not. Meaning, you can’t tell the 2 types of questions apart. For this reason, you have to do your best with all the CPA Exam questions you see. But, the fact that your AUD exam will include pretest questions may give you hope, as, in the event that you encounter an especially challenging or surprising AUD question, you don’t have to worry about it. You can just answer it to the best of your ability and move on knowing that it may very well have been a pretest question that won’t contribute to your score. The AICPA clearly explains the goal of the CPA Exam: to verify that candidates have the knowledge and skills required to fulfill the duties of a newly-licensed CPA and represent the CPA certification well. To make sure that the CPA Exam accomplishes this purpose, the AICPA defines the difficulty of each CPA Exam section with 4 different levels of skill. The AUD CPA Exam section tests candidates at all 4 of these skill levels. As you can see, AUD tests at the Remembering and Understanding and Application skill levels the most, but it saves space for the Analysis and Evaluation levels as well. Therefore, you must prepare to have a fairly deep understanding of the exam content in order to pass. AUD is the only section to venture into the Evaluation level of skill, yet it doesn’t test as much at the Analysis level as the other exam sections do. Furthermore, it also tests at the Remembering and Understanding level more than any other exam section. But only the Application level of skill is tested in all 4 content areas of AUD. AUD’s range of skill levels demonstrates that candidates should understand content areas II and III at the deepest level and the remaining content areas at a medium level of depth. So, you should prepare to commit as many as hundreds of study hours to AUD not because the range of content is broad but because the range of skill levels is. Just like the other CPA Exam sections, AUD starts by presenting candidates with 2 MCQ testlets using a multistage adaptive delivery model. Don’t let this big term intimidate you: just know that your performance in the first MCQ testlet determines the difficulty level of the second MCQ testlet you receive. As illustrated here, the first MCQ testlet you receive in any CPA Exam section will always be moderately difficult (“medium”). Performing well on this testlet will produce a slightly more difficult (“difficult”) second MCQ testlet. Performing not so well leads to receiving another moderately difficult (“medium”) MCQ testlet. The average difficulty of the MCQs within a testlet determine its difficulty level. And, the difficulty level of these questions isn’t binary. Instead, it exists on a numeric scale. Additionally, the CPA Exam gives you more points for answering a difficult question correctly than for answering an easier question correctly. Therefore, you won’t incur a penalty for getting a more difficult MCQ testlet or an advantage for landing 2 medium MCQ testlets. 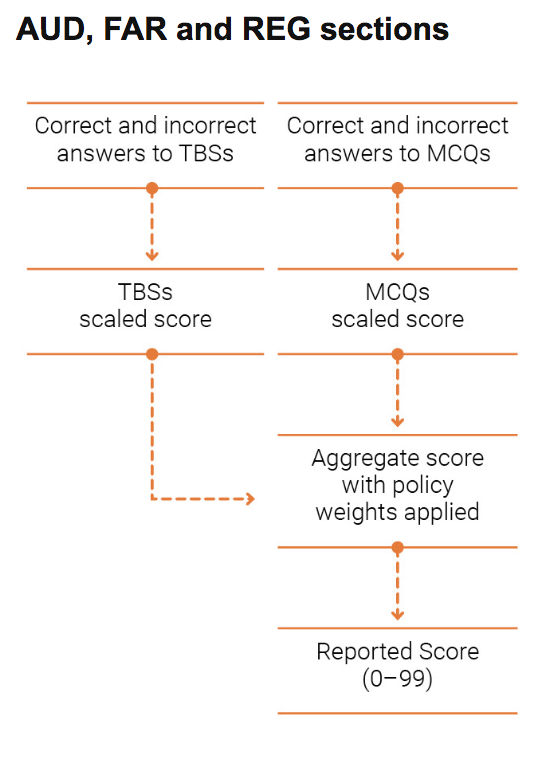 The difficulty of the TBS testlets does not follow the same pattern as the MCQ testlets. Instead, the CPA Exam establishes the difficulty levels of the TBS testlets in advance, so your performance does not affect them. However, you can receive partial credit for your work on the non-Research TBSs. No matter which CPA Exam section you take, you have the same amount of time to finish it: 4 hours (240 minutes). You also get 15 minutes to go through some additional testing screens at the beginning and end of the exam. What’s more, you can utilize a standardized 15-minute break after the third testlet (first TBS testlet). This break pauses the exam timer; any other break you take during the exam does not. This illustration shows you that you can take an optional break after each testlet. But again, the exam timer won’t stop during these breaks. So, take them at your own risk. The secret to securing the best chance to pass the CPA AUD exam is time management. Only by practicing time management can you be sure to answer every question on the exam and maximize your score. So, you must develop, practice, and apply a time management system before you sit for AUD. Or, you can just allot 21¼ minutes to each TBS. On the other hand, if you stick to answering each AUD MCQ in 1 ¼ minutes, you’ll finish the MCQ testlets in 90 minutes and have 150 minutes left for the 3 AUD TBS testlets. You could then divide these 150 minutes evenly between the number of TBSs (8), which yields 18 ¾ minutes for each. You would then have 37 ½ minutes for the first testlet of 2 TBSs and 56 ¼ minutes for each of the other 2 3-TBS testlets. So, using one of these 2 time management systems, you can allot anywhere from 1 to 1 ¼ minutes to each AUD MCQ. But again, due to the multistage adaptive delivery model of the CPA Exam MCQs, the second AUD MCQ testlet you encounter may be more difficult than your first AUD MCQ testlet according to your performance. For this reason, you may want to give yourself more time to finish the second MCQ testlet than the first. Therefore, you could spend 36-41 minutes on the first MCQ testlet and 40-45 minutes for the second. You would then have anywhere from 154-164 minutes left for the TBS testlets. You can take AUD and any other section of the CPA Exam during the 4 annual testing windows. However, you have to pass all 4 sections of the CPA Exam within a rolling period of 18 months. This period starts as soon as you pass your first section, so it, therefore, gives you 1 ½ years to pass the remaining 3 sections. If you don’t pass the other 3 sections during your 18 months, then you will lose credit for the first section you passed. So, you’ll then be on the hook to pass the sections you haven’t passed yet and the section you passed already (again). If you can’t do this in 18 months, you’ll also lose credit for the second section you passed. Your 18-month window will continuously restart and the start date will move back to the earliest section you passed until you pass all 4 sections within this time. After considering the pros and cons of beginning your CPA Exam journey with each exam section, I’ve concluded that you should start with the most difficult section. And at this time, the most difficult section is FAR. I suggest starting with the most difficult section because FAR requires the most study time and you only have 18 months to pass all 4 sections. Consequently, if you prepare for FAR before your 18-month window opens, your 18-month window doesn’t have to account for your FAR review. Therefore, this strategy gives you more time to pass the other 3 sections or even pass the CPA Exam faster! So, where should you put AUD in relation to FAR? I believe taking AUD after FAR is a great idea because the content of these 2 exam sections overlaps. AUD references material from FAR quite a bit, and you will see similar financial ratios and maybe even a financial accounting simulation in AUD. So, taking AUD after FAR lets you focus on some information that will already be familiar to you. You can memorize a good deal of the content, which takes less time. You’ll have experience with CPA Exam questions, so you can commit more time to mastering AUD’s tricky questions. You will have plenty of time to study for AUD and may even require less time because you took FAR first. Based on my personal experience, feedback from candidates, and recommendations from CPA review providers, I’ve concluded that you should expect to spend somewhere between 80-100 hours studying for AUD. If you’re an auditor or have already passed FAR, you may need to spend less time studying for AUD. So, to get a rough estimate of how much time preparing for the CPA AUD exam will take you, you should conduct a deeper investigation into AUD’s content. You can research AUD’s content areas, groups, and topics in the AUD CPA Exam Blueprints. Dying to be done with AUD ASAP? Then you’ll need to study for 20 hours a week so you can finish your review in 4-5 weeks. Don’t quite have 20 hours a week to spare? In that case, shoot for 15 study hours a week. If you can manage that, you’ll be ready for AUD in 6-7 weeks. If you really need to stretch out your studies, you can review for just 10 hours a week and finish your AUD preparations in 8-10 weeks. Failing AUD because you have no experience in auditing is easy to understand. People in this situation need to spend extra time familiarizing themselves with the audit process and the essential concepts of auditing because this information is all new to them. If they don’t give themselves enough time or ensure that they’ve fully grasped all of this new information, they may fail. So, why would auditors fail AUD? As I mentioned above, because they underestimate the exam. Their experience with auditing can make them overconfident and less concerned with targeting their weak areas, which they may doubt they have. Consequently, they may also need to dedicate more time to their AUD studies due to the depth at which the CPA AUD exam covers the auditing concepts and process. So, auditors don’t necessarily need to read the entire AUD book from cover to cover, while non-auditors may need to. However, both candidate types should answer all of the practice questions to ensure they’ve committed enough effort to AUD. So, what’s the best way to study for the audit CPA Exam? Well, I believe that no matter who you are, you’ll need to commit a lot of material to memory in order to pass AUD. If you are an auditor, you will already be familiar with the audit process and may just need to improve your memorization of a few parts. If you’re not an auditor, you must memorize all of the steps of the procedure. Either way, you can follow these tips to ensure you know what you need to know for the CPA AUD exam. Some people don’t feel that memorizing the entire audit opinion is necessary, but everyone agrees that you must remember the important points of the audit report, such as which specific sentence should appear in which audit opinion and where in the paragraphs that sentence should appear (Yes, AUD gets that specific). For this reason, I find that simply memorizing the report, specifically, the unqualified opinion, is much easier. Why put the time into memorizing the whole audit opinion? Because the audit opinion is like a cheat sheet for all of AUD. The audit opinion summarizes the conclusion of the whole audit process. Consequently, every sentence in the audit opinion exists for a reason, and the CPA AUD exam will ask you about all of these reasons. So, because you need to remember where a particular sentence appears in which audit report and which paragraph, you might as well memorize the whole opinion and walk yourself through the page in your mind as you answer the MCQs. To memorize the audit opinion, I separated the audit report into several sections. I believe that the arrangement of the audit report actually makes a lot of sense when you consider the reasoning behind it. So, after I analyzed the different sections, I wrote out the entire report and read each section aloud as I copied it. Doing this a few times really helped me remember it well. Thankfully, memorizing the audit report isn’t rocket science, so practice makes perfect! To memorize the different versions of qualified opinions, I would just create scenarios about what could go wrong in my mind. Consequently, using my imagination in this way helped me remember the wording of the qualified opinions. If you don’t feel that memorization is one of your strong suits, you can plan to write down the most important mnemonics of the audit process on your noteboard before you start the CPA AUD exam. Do this after you work through the introductory examination screens so your test doesn’t time out, and don’t spend too much time on this step so as not to waste precious testing time. But if you can do it quickly, you may find the act of taking this precaution helpful. Since multiple, catastrophic corporate failures shook the accounting and finance industry in the last few decades, the emphasis on internal control has increased, including on the CPA Exam. But conveniently, understanding internal control for the CPA Exam isn’t too hard because it’s applicable to everyday life. Furthermore, you can usually come to the right answer about internal control by common sense. Several AUD content areas address the various internal controls and internal control concepts (e.g. how weak internal control will affect the conclusion of your audit findings). Therefore, you need to know all the different types of internal controls, what they do, and what type of fraud they are positioned to prevent in order to do well on AUD. To ensure that you’re super familiar with internal control, answer as many practice questions and tests on this topic as possible. That way, you’ll have sufficient exposure to all the scenarios within internal control. And most importantly, keep answering questions about your internal control weak areas until the right concepts sink in and you’ve developed a strong internal control intuition. As mentioned, a defining feature of AUD that contributes greatly to this CPA Exam section’s difficulty is the presence of questions in which the answer seems to be subjective. These questions don’t involve cut-and-dry calculations. Instead, they present 2-3 answer options that seem correct. But of course, you can’t choose all 3 answers. You have to select the option that is the most correct. So, how do you pull this off? First of all, watch out for answer options that contain absolute negatives. Absolute negatives are words like “all,” “never,” “always,” “none,” etc. In most cases, these words indicate the wrong answer choice, as life is rarely so definitive. Secondly, recall the audit process, particularly the audit opinion. If you’ve memorized all of it, you’ll be able to see where the question fits into the process and determine which answer option fulfills the requirements of that step. 4. Visualize the real work of auditors. The difference in perspective about how difficult AUD is usually depends on whether you really understand what an auditor does. If you don’t know much about what auditors do on the job, then find an auditor so you can learn from them. The auditor could be a friend, fellow college alumni, or even someone you meet through your state board. As long as they’re a practicing auditor, they can walk you through their part in the audit process. You may want to bring a copy of the audit process with you so you can cover everything with the auditor. I can almost guarantee that the audit process will really come together in your mind once you know what auditors do, how they do it, and why they do it. And, remember, the core audit process of gathering information to form the basis of the conclusion comprises constitutes a large portion of the CPA AUD exam. So, while the audit process is all common sense, you can’t afford to not understand the specific procedures. Because the CPA AUD exam is all about auditing, you may find it pretty challenging. But it is definitely still passable, especially when you prepare for it using the right CPA review course. You can learn all about the best CPA review course for you and get great CPA review course discounts on this site. You can also discover all the benefits of becoming a CPA, how hard the CPA Exam is, the secret to doubling your chance of passing, the best schedule for the exam sections, how to study for each exam section, and more in my free e-course. Get the details about my free CPA Exam guide or sign up today to start the process of becoming a CPA! Hi Xiaoyi, thanks for your note. I hope you don’t mind I answer in English for the benefit for other readers. Basically your question is this: You just completed the AUD exam and used Wiley / Wiley test bank as review materials. After the exam, you don’t feel you know exactly the answer, as in you believe the one you chose is correct but is never too sure. Bombed the simulation — questions completely different from Wiley. First of all, relax! It’s done, and you don’t know the results yet. It’s quite possible that you pass and so don’t over-analyze it. But your concern is very valid because AUD is always this wishy-washy exam people are not too comfortable with. There’s often more than one answer, and you need to pick the best one. Yes, that’s the common compliant, or concern if you will. I don’t really have a sure-win strategy on this. But generally, I suggest that we should take each practice question seriously, and work on them carefully to make sure you understand why the answer you pick is correct. I also encourage students to read explanations on the incorrect answers, because it tells you why they are wrong. Some providers are better in explaining the wrong answers. Wiley isn’t the best, but good enough. I am planning to sit for Audit paper this December. I have recently passed CFA level 2 exams and it had a lot of Accounting Standards of GAAP and IFRS. In one of my previous foreign certifications, I passed a difficult Audit exam that was based on ISA ( International Standards of Auditing ). Do you believe AUD of CPA should be passed without fist taking FAR considering my background? It’s logical the you get it out of the way given your background. The more you get out of the way using your own strentghs the better. You have competitive advantage in audit, use it. How much time should i allocate for the TBS questions. It’s a 4-hour exam, with 72 MCQs, and 8 TBS.